Abstract: Albatron's 6800GT is not quite as fast 6800 Ultra version, but with its core running at 350MHz it is still plenty powerful! 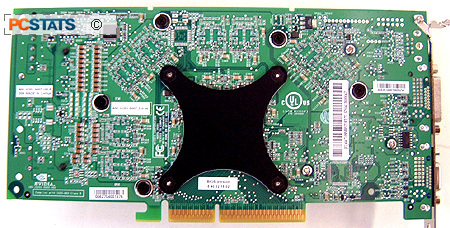 The nVidia GeForce 6800 GPU is a powerful chip, as are videocards based on it like the Albatron Geforce 6800GT. The 'NV40' GPU is the backbone of the 6800-series, and comes in a couple flavours; 6800 (12 pipe lines), 6800GT (16 rendering pipelines, 350MHz core), 6800 Ultra (16 rendering pipelines, 400MHz core), and the as of yet unavailable 6800 Ultra Extreme Edition (16 rendering pipelines, 450MHz core). 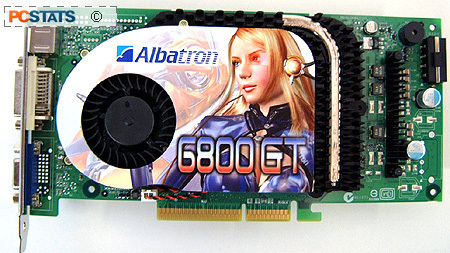 For example, the Albatron GeForce 6800GT is not quite as fast 6800 Ultra version, but with its core running at 350MHz it is still plenty powerful, and a heck of a lot less expensive than a 6800 Ultra. It's also safe to assume that the 6800GT is overclockable to Geforce 6800 Ultra levels (400MHz core), and in fact in our own round of testing we were able to push this card as fast as 433MHz! The particular review unit Albatron sent in is green in colour, but retail videocards will be the typical Albatron shade of blue. 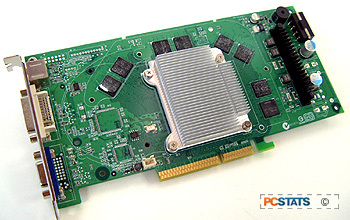 Those of you with lots of PCI cards will be pleased to know that the Albatron 6800GT is a single slot solution, unlike some past high-end nVidia cards which used large heatsinks that spilled over into adjacent slots. The card itself is literally based on the nVidia reference PCB design, both with respect to card tested here, and the retail version. Your probably already aware that the high end GeForce 6800 Ultra's have two additional power connectors. The Albatron 6800GT only requires one extra molex power connector, even though a second position is silk screened on the PCB. The reason for this boils down to the fact that the 6800GT and 6800 Ultra share the same PCB. 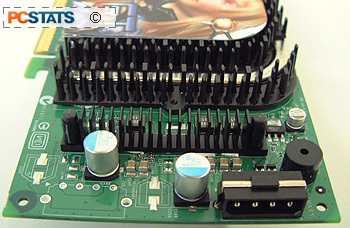 Experienced computer enthusiasts know that MOSFETs can generate a lot of heat. The Albatron 6800GT addresses this cooling concern with a small passive heatsink positioned so that exhaust air from the main cooler blows over its fins. During testing they did get quite toasty and I surely appreciate the extra work Albatron has done. Acoustically, the cooling solution on the Albatron 6800GT is near silent. During the benchmarks, the GPU fan could not be heard, even though the system was laying out in the open less than a meter from me. Of course with such a quiet solution, core temperatures were a little on the high side for my taste. If I remember correctly, a highly overclocked GeForce 5950 Ultra idles around 35 degrees celsius - the Albatron 6800GT idles around 50 degrees at stock! Whether those numbers are accurate or not is anyone's guess, but I think it is safe to say that good airflow in the case should be maintained. Along with the card, Albatron has included some nice long SVideo and coaxial cables. They're long enough for one to attach to the TV yet still have enough slack to hide the computer behind a table. 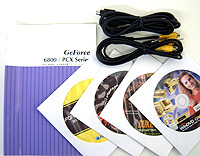 On the down side, the 6800GT package does not include a DVI-to-analog converter. The software package is also a bit thin.... but I guess the saving grace is that the 6800GT is pretty competitively priced at just over $430 USD. In the future though, I hope Albatron do take some steps to improve their software packages to match those offered by other manufacturers.